Might as well start with the cover stars, Mean Machine and Porsha Wuss in Angel Heart. I mentioned last time that this was a creator getting a bit silly with one of their characters and thus it continued in this issue. I don't suppose it is everyone's cup of Rosie Lee but I don't mind it. Mean has been rendered harmless and is marrying his true love, but as we all know, the path of true love rarely runs smoothly... I get a feeling it will all wrap up in the next Meg, and that will be sufficient for this strip. Part 2 of the Dredd story Damned Ranger wasn't great. It felt a little plodding in places, which surprised me slightly. I was huffing and drifting my way through it, so I don't think it could have been holding my attention too well. John Ridgeway's pens are good, but some of the colouring is a bit off; a little gaudy and unnatural looking. As for the stuck on, weird looking spaceships... Yuck! Possibly this is a design choice, but I don't care for it much. I think I struggle with the mutie-bashing episodes of Dredd a bit. Rounding up families and carting them off to some camp makes me uncomfortable with Dredd and MC1. This, however, is probably the point. Hoping we wrap this one up soon. It has the ingredients for a decent ending, perhaps it was just the tricky middle episode of a trilogy. Contrast that with Young Middenface which I continue to enjoy very much. Alan Grant, Patrick Goddard and Dylan Teague - take a bow! It's an interesting idea and is full of twists and turns. Our two mutie heroes are about to be the main course in the village's celebrations. Can they escape? I like it not just because it is a good story, but also because it is told from a mutie perspective, often portrayed as the villains of the piece (as I explained in the previous paragraph). Best original new strip in the Meg at the moment. Black Siddha opened up it's second episode with a few strange scenes with the Kali cult before then picking up the story of Rohan taking on the nasty junkie he was battling last week. I suspect some might think this is moving quite slowly, but I'm happy with the way the story is building an am finding I have more patience than I ever did for Devlin Waugh. Perhaps it's the Indian mythology I like, or the characters, I don't know. I'm liking it. And we had the return of the strange and fast breeding furry rodents of Mega City One in Whatever Happened To The Gribligs? The what, you might ask! These were creatures brought to MC1 in an early Dredd episode in the Prog and outlawed because of their super fast breeding cycles. Gordon Rennie has a bit of fun with this strip and it is well drawn by Steve Roberts in a style befitting the subject of the story. It was light and fluffy and I laughed a couple of times so it worked for me. Lots of singing in this Meg. Pretty much every story had a character or characters bursting into song. Coincidence - or are the creators having a bit of a laugh? In the reprints we had quite a few Charley's War, where we discover life away from the front lines isn't the holiday the soldiers were hoping for. And Hell Trekkers is enough to put you off your lunchtime sandwich with those dinosaurs still stalking our intrepid pilgrims. Not content with that, Wagner and Grant threw disease and a thick nuclear smog at them as well. Surely it won't be long before the dude in the Mopad, which is not adapted to the harsh environment, is toast. He seems to be out-living other seemingly hardier souls! 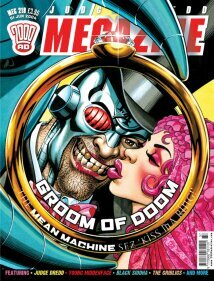 Another Metro Dredd was reprinted and it was so-so, a parody of TV talent shows.